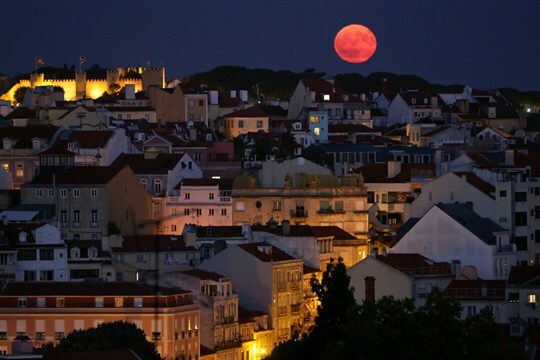 The full moon rises behind the Castle of Saint George in Lisbon, Portugal, Sept. 6, 2017 (AP photo by Armando Franca). LISBON—European politics are in turmoil. The United Kingdom is tearing itself apart after a vote to exit the European Union. Spain is deeply divided in the face of separatist demands from its Catalonia region. In France, the far-right National Front mounted a serious challenge for the presidency. Farther east, from Norway to Austria to Hungary, right-wing populism is resurgent. Even in Germany, where memories of the Nazis still hold significant sway, almost 6 million Germans—12.6 percent of those who voted—chose the anti-immigrant Alternative for Germany party in September elections. Across the continent, the established order of things, in place since the fall of the Berlin Wall, no longer looks so certain or robust.